Part of who I am, who I have discovered myself to be, is that I have a certain fondness for ritual and routine. I like it when I can predict what’s coming up and when I know what I should be doing and when. Now if I were in a Hollywood romantic comedy or playing the lead on a TV show, I would clearly be in the wrong and would have to have someone like Drew Barrymore or Zooey Deschanel show me the error of my ways. They would feel compelled to teach me a love of spontaneous chaos, to break me out of the stolid routine my life had become. Drew and Zooey can just piss right off, as far as I’m concerned. I like my routines and my rituals, and of them all, the one that really defines my week is the podcast – The Labyrinth Library. I started this back in aught-nine, after my sister floated the idea past me of doing short book reviews for the radio station she works at, WNPR. I’d been writing reviews for ages, and had a pretty good back catalog to choose from. The idea was that I would record a five or ten minute review and it would help fill space in the broadcast schedule. As it turned out, her bosses didn’t go for the idea, but that was okay – it gave me the liberty to take the idea and make it my own. This wasn’t my first podcast, actually. I tried making one a few years before, when podcasting was just beginning to catch on, but I very quickly realized that I didn’t actually have anything to say. The few episodes I did were just me talking about… things. And you know what? The internet has enough of that already. As I started listening to others’ work, one thing became very clear – if you’re going to ask people to spend time with your podcast, it should be about something. And for me, there was nothing better I could have chosen than books. 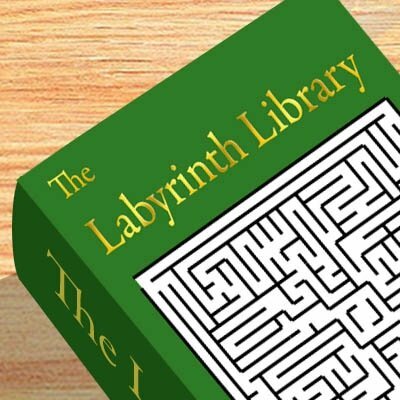 So I did my research, figured out how the whole process should work, and launched the Labyrinth Library on January 15th, 2009. I started with Good Omens, as a representative of what I love in books, and followed it by The Bad Beginning, as a representative of what I hate. Everything else fit in between those books somewhere. As it is, though, I have something I can be proud of. I don’t have a great history when it comes to committing to projects and following through with them, so it would not have surprised me if I had done this for a couple of months and then let it die out. But I didn’t. It’s fun to do, from the writing to the actual production of it, and as the years have gone on, I’ve become aware that there are people who not only listen to the podcast, but enjoy listening to it. And it is because I know they’re out there that I can set up my equipment every week, ask The Boyfriend to keep the dog quiet for a half hour or so, and put this together. So to everyone who listens, I am thankful for you. I don’t know what the future of the LabLib looks like, of course. As I have alluded to, I have a limited back catalog, and as I don’t read and review a new book every week (since I have a job and stuff), there will come a point where recording day comes and I don’t have anything to record. At that time, it’ll have to go from being a weekly podcast to an occasional one. I’ll still update, though, as often as is possible. I’ve done this too long and had too much fun with it to let it go entirely. So, in my ritualized, carefully-structured week, the podcast is something I always look forward to. It gives my week shape and it helps keep me busy. For that I am most certainly thankful.